I’m just three chapters into it so far. I don’t want to give anything away because there are definitely spoilable areas. The entire program is 6-1/2 hours, so there are a lot of scenes that are expanded, as well as parts that were not in the movie at all. I will say, however, that I’m really enjoying it. It’s much more than I expected. The sound effects, music, etc. The reading is terrific. They really put a lot into it and several scenes were very emotional. Only Mark Hamill and Anthony Daniels reprise their roles, but so far I’m not having any problems with getting used to the new voices. After a few minutes of each, I’m settled in and they become the character. That surprised me. It is safe to mention one part on this board though. We’ve all seen the deleted scenes with Luke and Treadwell out in the desert looking up at the opening battle( that ultimately gets him involved in the story), then going back to Tosche to tell Fixer and Camie and urging them to go outside, seeing how he’s an outsider in the group, seeing him meet up with Biggs again, etc. That scene was nearly an entire chapter and it’s done very well. It was nice to hear it really fleshed out. I’m listening to an hour each day. Each chapter is 30 minutes, which happens to be my work commute almost exactly, so it’s a chapter in the morning and a chapter in the evening. It will take me until sometime next week to hear them all. I’ll give a full review afterwards. Anyway, great stuff so far. I’m out of here, fellas. Chapter four starts in a few minutes. *update* - April 27th. No spoilers. Thanks to some heavy traffic and one day of bad storms, I finished the last episode on the drive home today. It is really incredible. I can’t tell you guys how much I enjoyed it. I really looked forward to the commute everyday and had a hard time not listening to it all the way through after about the third or fourth episode. I normally ride a motorcycle to work but after 14 hours on the road coming back from vacation only a day before, I was just too fatigued to suit up and ride, so I decided to drive. I took the radio drama with me for the commute. I liked it so much, that I drove every day this week. I could hardly wait for the next episode every morning. I had the thing playing before I was out of the driveway every day. The entire production is first rate – sound effects, music, acting – everything. I’m shocked at how deep it feels - how thorough. There’s so much more when there isn’t a two-hour time constraint. I really enjoyed the added chapters. Some of it is taken almost verbatim from the early film scripts. I thought everyone did an outstanding job with their characters. They really get a chance to get deep into them. It goes without saying that Mark Hamill makes the whole drama, but the rest of the cast did great work as well. Ann Sachs is awesome as Leia. She brings a lot to the roll. Very emotional in spots. Perry King was a great Han. Less likeable than in the film because you get a chance to see just how smug, self-centered, and untrustworthy he really is. He’s just not a likeable guy. Brock Peters was fantastic as Vader – again, more depth to the character. Everyone else was great also. This thing is up there with the film in my world. I enjoyed it that much. It’s a giant adventure and I felt like I was going on it for the first time. It felt far away - the universe felt endless again. C3PX, I can’t thank you enough for bringing the thing to my attention. My Star Wars universe grew substantially this past week. I also have the published script now. I'll start reading it soon. Anne Sachs (spell?) does a great Leia IMO. Wait till ya get to Perry King as Han Solo, he's just as good - if not better - than Ford. I found Perry King (the voice actor for Solo) to be one of the most "off" actually... along with Brock Peters (the voice for Vader). Nonetheless I've been enjoying these dramas too since I acquired them. It's quite cool to experience Star Wars again in a new, slightly different, and expanded way. My only problem is that I like listening to them as I go to bed, and I keep falling asleep during Episode 6. I think I've listened to Ben and Luke go into Mos Eisley about 20 times now. Yeah, Perry is a bit bad at first, but later he switches to more of an "I'm immitating Harrison Ford!" kind of thing; in ESB he sounds much better. Just my opinion though, please feel free to disagree. And yes, Brock Peters is pretty bad as Vader. WARNING: You are in for a shock with Yoda; I like it, but you might not! Yeah, Han and Darth are the most jarring to get use to. But in a way I really like the different actors portraying them. I like Darth Vader, because he seems like he is right out of an old science fiction radio serial. He may not be James Earl Jones, but if you unlearn all you have learned and let the story take you as if for the first time, Brock Peters really does a good job of the stereotypical evil menacing villian, which is what Vader was originally. 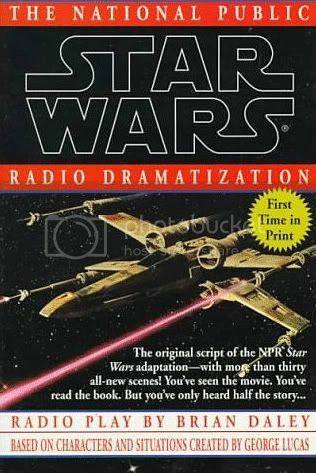 I always felt the radio drama did a great job of taking Star Wars back to its roots without all the baggage. It is something plain and simple you can enjoy, even if you havent seent he movie. I always felt bad for people who never read LOTRs until the movies came out, because instead of getting to discover and imagine all these fantastic places, you only get to see what others imagined them to look like. For many people Frodo will always be Elijah Wood. For me, Elijah Wood merely portrayed Frodo in a movie at one time. With the SW Radio drama I like to try to forget everything and reimagine it all as if for the first time. I like to force myself to think of Vader more as how he appeared in the early conception art. I am not sure why I like to do this, but I find it very refreshing. Another thing I like about the NPR series is the catchy episode names! Aren't they great? Some of the namers are pretty good, yes. But you know who makes a very good performance I forgot to mention? Bernard Baron *again, unsure of spelling* did a good Obi-Wan. With the SW Radio drama I like to try to forget everything and reimagine it all as if for the first time. I like to force myself to think of Vader more as how he appeared in the early conception art. I am not sure why I like to do this, but I find it very refreshing. That's amazing... I'm exactly the same way. In fact, I've even done my own CD labels for the discs, and I used Ralph McQuarrie's concept art for that very reason. It goes along with the whole idea of this being Star Wars, but from a slightly different perspective. Amazingly, I was able to find a McQuarrie picture to match the story on each disc of not only Star Wars, but Empire Strikes Back and Return of the Jedi as well. Another thing I like about the NPR series is the catchy episode names! Aren't they great? They do totally make me feel like a kid listening to a radio drama set back some time in the '50s. One other thing, for those interested -- here's a page that offers a synopsis of every episode of the radio drama from each film. I'm not going to be listening to anything other than Star Wars. In fact, I've even done my own CD labels for the discs, and I used Ralph McQuarrie's concept art for that very reason. It goes along with the whole idea of this being Star Wars, but from a slightly different perspective. I did the very same thing for my soundtrack CDs, minus the copy (text). corellian, those labels do really fit well. I love McQuarrie's stuff. "They do totally make me feel like a kid listening to a radio drama set back some time in the '50s." Yeah me too. From a very young age I thought it would be cool to have lived in the 50s listening to radio instead of TV. I even bought one of those vintage old bookcase radios to give my radio drama listening habits a more authentic (though anachronistic, since most of what I listen to was made in the last 30 years) feel to them. If your a Tolkien fan by any means at all, there is a good deal of his works adapted to very high quality productions done by the BBC. The Lord of the Rings adaption is quite good. If you guys like that sort of stuff and happen to have XM Radio - they have a channel with those old radio dramas - 164. The Shadow, Green Hornet, Gunsmoke, Dragnet, etc. Cool info CP3X and Anchorhead... I'm in the midst of reading Lord of the Rings right now, but I'll try to remember to check out the radio dramas once I'm finished. As for those radio dramas on XM, I wish I had it so I could listen to them. One in particular, "Lights Out," sounds like it would be a hoot to listen to. Yeah, I don't have XM radio either, but it is fairly easy to find a decent amount of any of those online in MP3 format with minimal searching through google. It would be nice to just turn on the radio and hear them though. corellian, are you enjoying LOTRs? First time you have read it? Tolkien is truly an amazing writer. I really like his minor works too, of which Leaf by Niggle is my favorite. The radio adaption for LOTR is on equal grounds with the SW adaption in my opinion. Gollum's voice is a bit too much though, but other than that it is great. A lot better adaption than the recent films. I forget how many episodes it is, but it is also in thirty minute segments. If you do decide to give it a go, becareful because there are two different radio adaptions of it, the BBCs being the good one, and other one (by NPR I think) is unbelievably horrible. Sounds like it was recorder by a bunch of eight year olds. Hitchhiker's Guide to the Galaxy (which actually started off as a radio show and was later adapted to a novel rather than the other way around as is commonly believed) is my third most listened to radio series right next to the BBC's Lord of the Rings and Star Wars. Hitchhiker's Guide to the Galaxy (which actually started off as a radio show and was later adapted to a novel rather than the other way around as is commonly believed). I remember listening to those when they first aired in the 70s. I wasn't a huge fan, but I did listen occasionally. A buddy of mine back then was a huge science fiction nerd. He was the one that discovered the radio show and told me about it. He also bought Splinter Of The Mind's Eye when it first came out. I can still remember seeing it at his house. Man, he read science fiction novels constantly. I hope I'm not going too far off topic in this thread... but to answer your question C3PX, yes, I'm enjoying LOTR very much. I'm just beginning book 4 (the middle of The Two Towers), and I had read all the Appendices first (which I thought was amazing). The only written work I can think of that's comparable in depth and detail is Dune (which I really love but haven't read in a long while). And yes, it's my first time reading LOTR. My only regret (as you mentioned earlier) is that I didn't read the novels before seeing the films. As I'm reading, I sometimes find it hard to reconcile the images I'm getting from the book with those that I still have in my head form the films. For example, I have to constantly remind myself that Theoden is an old man with long, white hair, and not the youthful, red-haired Bernard Hill from the films. That being said, I think the films are amazing in terms of how much attention was paid to the details and overall atmosphere; I truly feel they do the novel justice. As for Hithchiker's Guide, I do remember hearing that it was originally a radio drama, and that it was quite good. I love the novel, so it might be worthwhile for me to check out the radio drama in the future. Since I enjoyed Splinter so much, I had decided to look for a copy of the Star Wars novelization from '77. While I was bouncing around the internet looking for it, I also decided to see if there was a site where I could download the script used in the radio drama that C3PX put me onto. Figured I'd print it out and read it like a novel. A few pages into searching, I discovered that it has been published once before in the form of a book. It'll be here in about a week. Of course, I'm right there with you after making that joke. Looks like a cool find Anchorhead; I'm interested in checking it out. I have always intended to read the SW novelization. I have made several attempted and made it to various points before getting sidetracked and having to restart years later. It is actually really good (as far as I have read) it really feels like part of the "Big Galaxy" too. I really like when Luke asks Obi-Wan what a duck is, and Obi-Wan tells him. Most people point that line out as something funny with inserting a real world animal into this alien universe, but that line has a lot of relevance. Luke grew up on a desert planet where most of the indigenous wild life are reptilian (basing this on the Kryat (sp?) dragon and the Dewbacks and where there is no surface water to speak of (which would be a must for a duck). So it is makes perfect sense for him to wonder what it is. It also makes perfect sense they would have ducks in the SW universe, after all they have humans, why not ducks? Not everything has to be bizzare and alien. Anchorhead, you probably would like those Han Solo books, they are 100% pre-ESB. I have them all (in their pre-ESB publication, lacking the name SW and all), I bet they are as easy to find as SOTME. Now I am wanting to dig out all my BU books and start reading. Now pulling away from the topic again, corellian, if you do a search online for original Lord of the Rings artwork there is some really fantastic stuff. Alan Lee is my favorite. Anyway, maybe some of that artwork will help purge the movie imagery from you mind and help you to develop your own personal image of everything. I am at the moment eagerly awaiting Children of Hurin (a newly published work of Tolkien's) to come in the mail, I can't wait to read it. Don't worry about having seen the LOTR movies before reading the book. It does spoil a lot, but there are still plenty of surprises waiting for you. My absolute favorite bit of narrative from the whole work is the second to last chapter of the six book. I pick up my leather bound copy and read just that chapter alone sometimes. If you really thought the Appendices to LOTR were amazing, I bet you would really enjoy the Silmarillion or perhaps even some of the collections of fragmented bigs of manuscripts that have been published as The History of Middle Earth in 12 volumes. I remember buying that book when it came out. I still have it sitting on a shelf about 10 feet away. I think it has some additional scene extensions and material not in the final radio drama, but my memory may be decieving me. If the book is ungodly hard to find or something, drop me an email (at the hotmail one) and I'll look into scanning it for the community or something. Then again, if its easy to get, just go shell out the money. I have never listened to these, but Anchorheads posts are making me want to. Also, haven't seen you in a while MagnoliaFan. How is your updated Star Wars edits coming along? It does. I read what I think is the forward by Brian Daley and he said they had to trim a few scenes to make room for extended pieces of music and credits. If the book is ungodly hard to find or something, drop me an email (at the hotmail one) and I'll look into scanning it for the community. It's not. I already ordered it. Thanks, though. Man, I ordered the book version on Thursday. It said "ships in 4 business days" - and it arrived about 3 hours ago. Damn. Bought it through the used section of Amazon (like I did SOTME). It's supposed to be used, but it looks brand new. It was 9 dollars. Yeah, I love amazons market place. They usually give a long estimate of how long it will take, mostly everything I have ever ordered came earlier than the estimated arrival date. 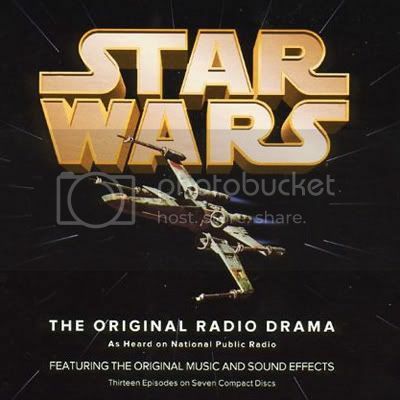 So I'm listening (again) to the Star Wars Radio Dramas. I really do enjoy it. I agree that there are some scenes that are unnecessary, but since it was released as weekly episodes, this may have been less of a problem. Several of the scenes are really interesting and add to the overall story, so I have no problem with those. I really enjoy having Mark Hamill and Anthony Daniels there. I think it helps keep the familiar feel. I really enjoy the Obi-Wan actor (can't remember his name), and feel that he does a very nice job. Ann Sachs is a very good snarky Leia. What I find interesting (and was noted earlier in this thread) is the very different Vader and Han actors. Vader feels very different, more subject to his passions. The Prowse/Jones film version always seems very angry, but always in control. The radio version seems more willing to lose his temper and lash out. His voice is less intimidating, but I think earlier posts nail it that he feels more like a classic villain. Han feels even more different, where he comes off as a bigger jerk. His voice is more reminiscent of an arrogant high school punk. At first he was quite startling, but I'm surprised how well I could settle into this very different Han. I don't like him better than Ford, but I can't say that I like him much less; he's actually a pretty interesting different take. Let's see, I also like the Biggs actor, the Tarkin actor...man, I guess I just really am surprised how well I enjoy the radio drama. I'm nearly done, so I'll be starting ESB soon.